Source: Michael Slackman, For Irans shiites, a celebration of faith and waiting, New York Times online, 30/08/07. When I was younger, I was afraid of lightning, thunder, darkness, spiders, cockroaches, and basically anything that was either smaller or much bigger than me. I was afraid of loud noises and being alone. And of strange men who drove fast cars and wore dark clothes. This unlucky collection of fears was matched by an equally unlucky set of circumstances. Growing up in the tropics of central Florida meant that I frequently woke in the middle of the night to the tickling, delicate feet of a giant wolf spider crawling over my face in search of some treat or other. Once, I woke with my head laying on my mattress sideways looking at my bedroom door. I blinked my eyes and let their gaze drop to the surface of my mattress. There, two inches from my mouth, was a four inch long water bug, clicking away, looking at me with as much fear as I had. It was its last look (sadly for it) as I immediately swiped it away until it hit the wall with a loud smash. The disgusting spot it left on my bedroom wall never fully came off. It remained as a reminder of my battle with the creatures of the night. I needed to be vigilant in protecting my room. This led to an unhealthy association with all manner of insect repellent. Fear of encounters with the hairy, or armour clad creatures of Florida didnt outweigh my fear of sleeping alone however. I was so terrified that Id be murdered by Freddie Kruger or Ted Bundy or some other serial killer who specialized in dissecting small children that I often snuck out of my bedroom at night, pillow and blanket in hand, and crawled to one of my four sisters bedroom doors. Id crack the door open, just slightly, and lay half in their room and half in the hallway. I didnt want to be caught by my parents and sent back to my bedroom, but I also needed to be close to another, trustworthy person so the beasts of the night couldnt get me. Id wait until everyone was asleep before making my stealth bed in the doorframes of our house. Id fall asleep, comforted by the knowledge that I was protected by the sleeping body a few feet away. Then just as the sun was rising, Id crawl back into my bedroom and wait for the house to waken in voices. I never overslept. I developed an uncanny sense of timing. On nights when it was storming out, Id be racked with panic. The sudden shock of lightning coursing across the sky and the clap of thunder filled me with a sense of dread beyond words. I was convinced that the lightning was going to reach inside our Tudor style house and burn me to a crisp, before I was able to develop into the rich, famous superstar I was convinced Id become. My fear reached its zenith during a particularly bad hurricane in the mid eighties. My family all gathered at my uncles house (the uncle who looked like Satan, with his long goatee), and hunkered down in the darkened hallways of his boarded-up house. We ate canned food, and played games by candlelight. Because all of the windows were covered with plywood, I couldnt see outside, but I could feel the strikes of lightning hitting all around. I was shaking and on the verge of tears for an entire day. Inconsolable. At about six oclock that day, suddenly the world became quiet and still. We were in the eye of the storm. We all ran outside to see the damage. It was the strangest stillness coupled with the signs of the storms destruction: trees down, cars overturned, power lines swinging and sparking on the ground. Amid this wreckage, suddenly my fears quieted. My tears stopped. My heart rate returned to normal. Looking into the face of the demon silenced my terror. I saw how beautiful the destruction was. How total. I gave into the silence of the still, charged air, and was able to breathe again. We went inside to wait the storm out. My insatiable terrors lessened as I got older. I learned to appreciate the silence of an empty house, the beauty of a spiders industry and the destruction of a storm. I learned to enjoy the constant waiting, of being present in a world that has its own logic, its own plans for my eventual demise. I might get eaten alive by a brown recluse spider on a trip to Texas, or I might drown in a tsunami on a visit to an exotic foreign beach. Instead of being swallowed by the possibilities, I just wait. Wait for the end. Wait for the next beginning. Wait actively and with engagement. I wait for the little beasties to begin their midnight raid on my apartment, collecting bits of food and dragging them back to their nest, their hovel, their home in my home. And I wait for the kiss of my lover waking me just before my alarm goes off (he thinks Im asleep, but Im just waiting for him, patiently). Somehow, my childhood traumas have been recalibrated in my body as an antidote to boredom, to fear. 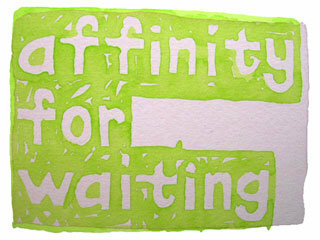 And now Ive developed an affinity for waiting.